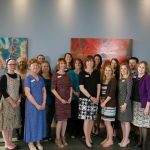 Thanks to the Health Care Foundation and the REACH Foundation, more than 50 leaders of area nonprofit organizations gathered at the Kauffman Foundation on May 15 for the first in a series of workshops. These workshops were designed to provide technical assistance to engage leaders to consider how slight shifts (referred to as 5 percent shifts by the New York City-based Building Movement Project) in their organization’s operations can actually amplify its advocacy presence. And, you can do all this without risking tax-exempt status, requiring months of preparation, or intimidating board, staff, volunteers or clients/customers. Judging by the turnout, the enthusiasm, and the sheer volume of ideas shared through the panel and small group discussions, the Kansas City region is ready to step up to a 5 percent shift and beyond. We may never be the same – in a good way! The workshop’s focus was “Using Your Whole Team.” Melinda Lewis, on the faculty of the University of Kansas’ School of Social Work and technical assistance providers for the Foundations’ advocacy program, kicked off the morning with a mini-lesson on the framework for advocacy as practiced by nonprofits. Melinda encouraged leaders to “tweak” their operations to incorporate advocacy in all facets, and to understand that advocacy accompanies many forms of service provision/engagement. Irene Caudillo, president and CEO of El Centro, Inc., shared how the organization has integrated advocacy in all staff roles by revising job descriptions and performance evaluations, to ensure that all staff were empowered to consider advocacy as critical to their daily responsibilities. She highlighted the work of one of her staff who was able to advocate for change by making the challenges faced by undocumented persons poignantly vivid to private and public agencies that she encounters. Evie Craig, president and CEO of reStart, Inc., encouraged leaders of organizations to tap into the opinions, experiences and spheres of influences of clients/customers and volunteers to operationalize public policy and social change priorities. Using a service learning philosophy, reStart’s manager of volunteer resources, integrates discussion of the many social and policy issues that impact homelessness into every volunteer experience. The result has been not only increased numbers of volunteers, but increased utilization reflected in more hours per each volunteer and support for the organization’s annual Advocacy Day. Joanna Sebelien, chief resource officer for Harvesters, shared the innovative ways that Harvesters has identified and taken advantage of every opportunity to reach the public with their advocacy message. For example, Harvesters’ truck drivers have many contacts with the public and the organization now provides them with information and training so that even a delivery of pizzas can present a “teachable moment.” The agency’s motto, “give food, give money, give time, give voice,” reflects an organization that sees all contributions as equally valuable to achieve its mission. The workshop concluded with lively and engaged small group discussions around specific ways of integrating advocacy into direct service organizations. Nonprofits across the region are finding that issues in the current social and political climate (Affordable Care Act, Immigration Reform, the Farm Act) have been the catalysts for examining the many benefits of integrating advocacy into their operations. Is Your Nonprofit Ready to Tackle Advocacy?